Kennels and dog school for Almeria and Murcia. 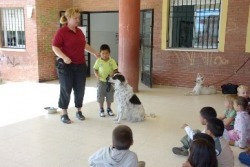 In this project we visit schools where we teach about dogs to young children 4-7 years of age. The aim is to improve general awareness of dog care, starting with the kids. We speak about what dogs need for their care, and how dogs respond to people. How to recognize an unfriendly dog, or a scared dog, is explained. How to stroke a dog, not to hurt it, and most of all not to abandon it! Even the most sceptical teachers have reacted with enthusiasm! We will continue this project in the area of Aguilas. An effect we experienced in the school project was that some kids change entirely when stroking a dog; some kids that are normally quiet and introvert all of a sudden start speaking and smiling! After reading more about this effect, which is more commonly known from therapy with dolphins, we are now developing a service to autistic kids and elderly people with Alzheimer. We are currently taking on a course in Madrid, from an experienced therapist who works with dogs. We might be able to offer this new service by next year, to this relatively unexploited area of canine-assisted therapy to people. We invite patient societies or institutions that might benefit from this to get in touch with us!